That testimonial came from a Catalina 30 sailboat owner who annually takes a two-week cruise with his family on Lake Michigan. During vacations prior to owning their “Air Head” Composting Toilet, this family would plan their trips from one pump out system to the next, thereby significantly limiting the variety of places to cruise because they had to pump out every few days. With the “Air Head”, they now plan trips without having to pump out since the capacity of the “Air Head” Composting Toilet allows them to go two weeks without emptying. RV owners have discovered the same advantage. “Boon docking” no longer has to be limited to what the black tank can hold. One month of full-time use by two people will yield five gallons of non-offensive smelling, semi-composted material which can be further composted in a plastic garbage can. If you need more capacity, a second tank can be used. The urine, generally considered harmless, can be emptied on the ground in rural places. In standard mobile installations flexible hoses are bound to smell over time due to gas permeability of these hoses. In gravity systems, odors from the holding tank can enter into the living space. Our system makes and processes waste with no offensive odors and uses no permeable hoses. Combined with its active venting system, it simply will not smell up the the living area. How many mobile sanitation systems can make this claim? The solids tank may hold enough solid matter for a summer season of weekends. This surprising ability to hold so much in so little space is due to the absence of additional liquids and the product’s ability to break down the matter. For weekend use, the “Air Head” Composting Toilet will contain approximately 80 uses. Full-time use, 60 uses or two people for 1 month. When rubber parts in standard mobile heads break due to wear, the unit has to be taken apart, exposing you to contamination as a result of passed sewage—not a pleasant experience. The “Air Head” Composting Toilet is predictable and reliable, and it uses no moving rubber parts. With so many complex systems of your boat, it’s refreshing to have one less thing to worry about. Save the rocket science for the radar. The “Air Head” is self-contained. Everything happens directly beneath the toilet seat. There is a certain peace of mind that goes with not having 20 odd gallons of waste sloshing around in a holding tank under your bed as you try to sleep! For boaters, no thru-hulls… no holes in your boat! Confused about the myriad of parts? 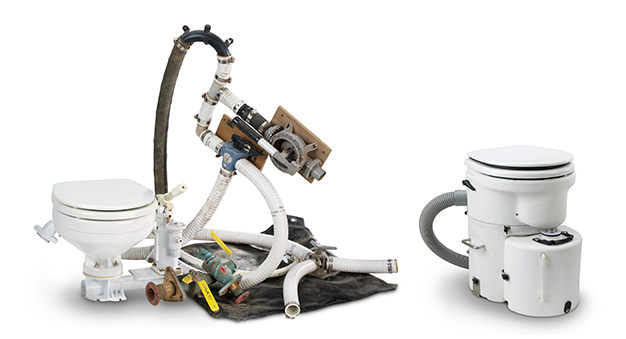 Valves, pumps, hoses, clamps, toilet, tank, vent ports, etc. are necessary for installation of a holding tank. The “Air Head” Composting Toilet is a complete, all-in-one unit for much less than the cost of a holding tank system. Backed by ONE manufacturer.